Your ceilings and walls repaired fast. Skilled and nice work crew. Free job estimates. Trustworthy yet affordable. Your job will be done right. Or it could be you just want to have some damaged walls mended. They are professional installers of sheetrock walls and ceilings. They do repairs too. They work on several types of different projects. Some are new construction; a great many others are maintenance and renovations. 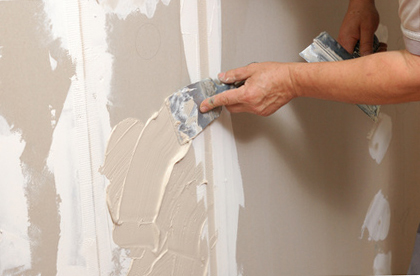 Restoration projects might involve patching a hole or two, exchanging areas of sheetrock, or a blend of the two. They are able to work with homeowners, landlords, property managers and contractors. 1. Truck the gypsum drywall to the job location. 2. Hang the sheets to the walls and ceiling. Once these jobs are accomplished, the new wall and ceiling areas are ready to paint. They normally complete each phase, although some property owners do not need each of the steps done. As an example, in case you only want sheetrock trucked to your property, and you would like to do the rest of the jobs, they can do just the delivery. Some folks want to screw the sheets up on their own, they just want them to return afterwards and do the seam taping, mudding and finish steps. They can also bring out and put in specialized wall boards for high dampness rooms, such as tub and shower areas. 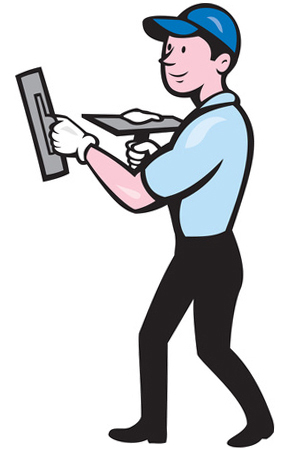 And they likewise have specialized extra-sturdy wallboards they use on wall surfaces where you intend to put on tile. Accidents and other problems will happen when you own a home. Sheetrock could get wrecked in many different ways. It does not take very much effort to place a hole or dent in a wall or ceiling. If your wall has a single hole in it, and that hole is in an out of the way spot, you may probably attempt to fix it all by yourself by applying a wall patch kit. A homeowner’s initial try at putting on a repair patch generally won’t be perfect, but it’s usually okay. If you discover you don’t have a talent for it, you can always call someone else to help out. However, if you have a hole that is in a very noticeable area, you may want to leave that fix to someone who is more experienced in doing that work. In the final days of a repair, they work on the surface of the repaired or new finishes to ensure they match up with the surfaces of the present ceilings or walls in the remainder of the room or house. Making a couple of old or dented interior walls repaired and ready for repainting. Cutting out and exchanging sections of damaged drywall. Working on bigger scale removal and replacement of an entire room or more. Whatever scale your maintenance mission is, they’re interested in helping. New walls and ceilings are almost always textured. Simply unfinished – only taped, designed for unfinished work rooms or garage areas. Smooth finish – zero texture, ready for painting or wallpaper. Simple texture – contributes a little bit more depth. Complex texture – hand-troweled and more tricky to do. Texture matching – your replacement materials match with your old ones. Do your ceilings show that popcorn surface texture? If you want, they will take off and replace your old popcorn ceiling surface with a modern looking one. They are a dependable local company that takes on interior ceiling and wall remodeling projects. Their plan is to finish your job promptly, at the price you expected and have you really like the outcome. They work with only the top manufacturers, so the materials they install at your property will be durable and strong. Many renovation tasks produce a little mess. Their work crews try everything they can to minimize the dust and keep it contained. Once your job is finished, they cart out all the garbage that was generated and all the unneeded materials. They accept a number of different projects. While many of them are inside residential properties, a certain portion consists of commercial buildings too. They know you have options. They hope you’ll consider working with them. Most folks want to receive an estimate. The final cost of a project can depend on two or more variables, but the volume of materials and how many work hours it will take to complete the job are usually the top two. Because there can be so many variables, it’s best to just talk to them on the phone and get your quote. Painting is an activity that a lot of homeowners like to do themselves, so just have them understand what you want to do. You can often find them working on jobs around the downtown area or in one of the suburbs or nearby communities like Montclair, Claremont, Diamond Bar, La Verne, South Pomona, San Dimas or West Pomona. They do a lot of work in the central and downtown area, as well as in most of the suburbs too.